Hoopla Bee Redemption Machine is a hoopla game ticket redemption machine, which players toss hoops onto pegs to win the scores. Features with bright and attractive cabinet printing with exquisite bee patterns, intuitive seven pegs and control panel design, accurate and fluent scoring system. Hoopla Bee is a perfect game that can be enjoyed by the family, use the hoops to hook the LED light pegs get the fun and reward. 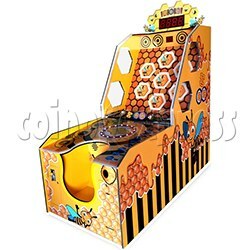 About Hoopla Bee Redemption Machine, play with Hoopla Bee game, insert coins and then start the game. Player uses the hoops to hook 7 LED light pegs within the given time, win the scores by hooking the hoop on the peg. Hoopla Bee Redemption Machine game details: to hoop more pegs, to get more scores and win more tickets. Throw the hoops and get them hook as many pegs as possible, accumulate to a certain number of scores will activate the bonus round.